FIVE of the leading sport fishing clubs in the country, together with the Department of Tourism, Provincial Government of Surigao del Norte, House of Representatives for the First District of Surigao del Norte and the Philippine Surfing Federation, convened recently in Manila to officially announce the 4th Siargao International Game Fishing Tournament, which is annually held in the town of Pilar in Siargao Island from April 28 to May 1 next year. The first-ever champion of the Billfish Category of this annual game fishing tournament, Marfin Tan of General Santos City, expressed his full support for next year's event and committed to bring more anglers from the cities of General Santos and Davao. His group also committed to donate one Honda Marine engine for the local fisherman who will obtain the highest catch in the Billfish Category. Other leading clubs in the country such as Silver Jack, Cebu Anglers Association, Philippine Sports Fishing Club and Philippine Game Fishing Federation represented by their presidents Peter Lu, Exequel Vergara, Richard Sharp, Bong Castillo, Daniel Lu and Gordon Uy (the tournament director) have also demonstrated their support to this biggest game fishing tournament in the country. Team Nonino, headed by Noli Manas, is thrilled to be once again participating in this prestigious international tournament and pledged to give two 12-footer or 14-footer sports boats to the municipality of Pilar while two Honda marine engines will be donated by Rep. Francisco Matugas. The boats will be used to monitor the illegal fishing activities in the municipal waters of Pilar and General Luna where the tournament will be held. Meanwhile, Rep. Matugas, together with Surigao del Norte Gov. Sol Matugas guaranteed to give a total prize money of P350,000 or more than US$8,000 for the tournament. The four-day tournament, which will start on April 28 and end on May 1, is expected to be attended by around 100 anglers from United States, Australia, Japan, Taiwan, China, United Kingdom, Singapore, Malaysia, Russia, and Philippines. The anglers will be vying for the following categories: Main Category (Using outrigger boat), Biggest Billfish Category, Biggest Wahoo/Tanguigue, Biggest Talakitok, Biggest Dorado, Biggest Others except shark, stingrays, puffer fish, dolphin and turtles; Open Category (Using private yacht or any fishing boat) - Biggest Catch, Highest Total Catch Each entry should have a minimum size of 15 kilogram. Rep. Matugas claimed that Siargao is always hosting teams of experienced big game fishermen for these exciting events, but novice competitors who just want to experience the thrill and camaraderie of sea fishing tournaments are welcome, too. 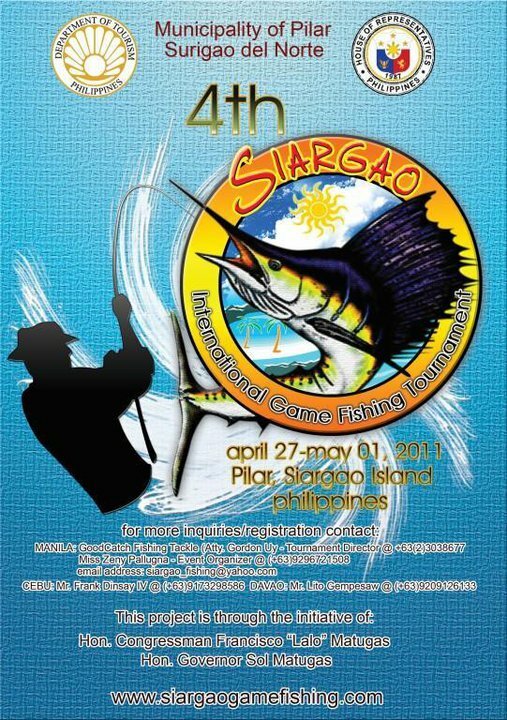 This 4th Siargao International Game Fishing Tournament is the largest and only game fishing event in the Philippines that is being organized and supported by the government. Siargao can be reached direct by plane from Manila via Cebu through Cebu Pacific every Fridays and Mondays. There is also a daily flight either from Manila to Butuan or Manila to Surigao via Philippine Airlines or Cebu Pacific. The Department of Tourism will be providing a shuttle from Butuan/Surigao airport to Surigao City seaport. From there, one can hop-on to a passenger ferryboat to Siargao Island, which has an approximate travel time of two hours.